Jenni Notton was born in 1946 in Marlborough, Wiltshire. After leaving school she studied at Southampton College of Art from 1963-65 and then at Winchester School of Art from 1965-69 specialising in painting. Married to Richard Warner, Painter, from 1979-1997. From 1976 until her retirement in 2010 Jenni was a lecturer in painting and drawing at a vareity of institutions including the Bracknell College of Technology, the Reading College of Technology, the Maidenhead College of Art, South Hill Park Art Centre, and both the Burnham and Bracknell Colleges of Adult Education. 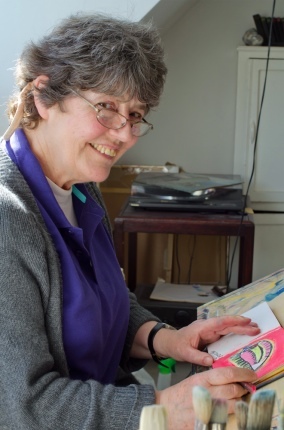 Jenni became a member of the Reading Guild of Artists in 2010. Jenni is now concentrating on her own art. Whilst I was a student at Winchester School of Art studying Fine Art Painting, I elected to visit the pre-historic caves in France and 'Altamara' in Spain. They left a lasting impression on me for their elegance of line and form, directness in execution, and for the profound emotion they express; the essence of spirit of Animal. It is thanks to this 'spirit' and with my love of the primitive, that each drawing and painting that I make is a discovery of feelings triggered by the world, and the memory of landscapes that are close to my heart. I wish to capture something of 'spirit' and 'essence' of subjects by working with a direct approach, using immediacy in execution; and to stay open in allowing the image to form. Colour is used symbolically to aid this expression. I work in Acrylic, Watercolour, Chalk and Oil Pastels, sometimes combining these media. I draw daily, celebrating life by working directly with pastels in 6" X 6" sketchbooks. This allows me to conjure up and magic from the unconscious, symbols that represent feelings and impressions of place. The recent and past pictures I have selected I hope best reflect my ongoing exploration and my continuing love of drawing and painting.